How about a refreshing and flavourful salad? This unusual combination is a real winner! A ‘ONE HIT WONDER’ at my last dinner for 16 people. 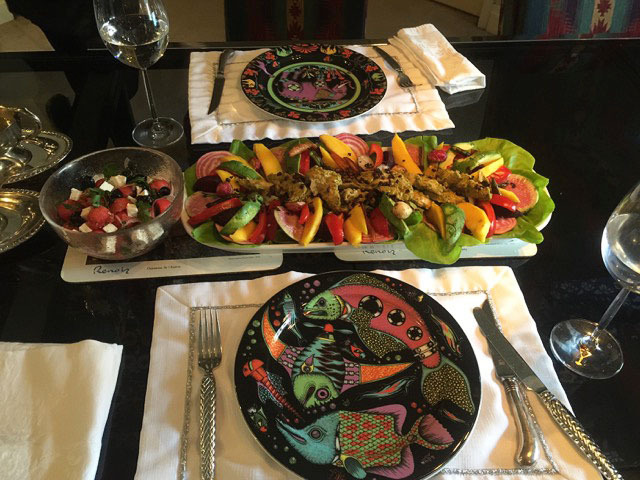 The colourful, delicious salad is an enjoyable departure from your regular dinner servings. Make this salad for your family and friends and watch the smiles appear. With these refreshing, succulent flavours you have just entered ‘FLAVOUR TOWN’. 1. Cut the red onion into fine slices. Place the onions in the lime juice. This will soften the sharp flavour of the onions. The lime juice will turn a light pink colour. 2. 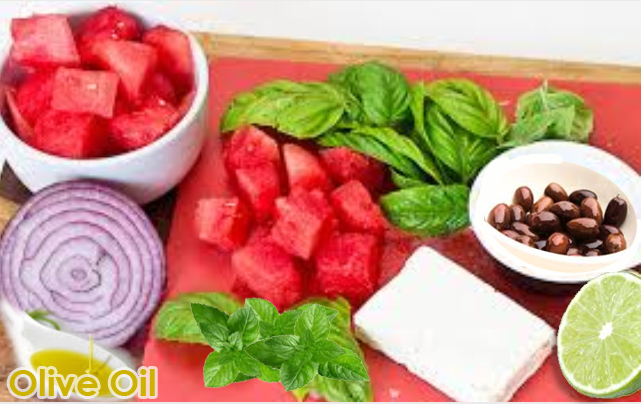 While that is marinating, cut the watermelon into cubes or balls using a melon baller. This looks so appetizing. 3. Cut the feta into bite sized pieces. 4. 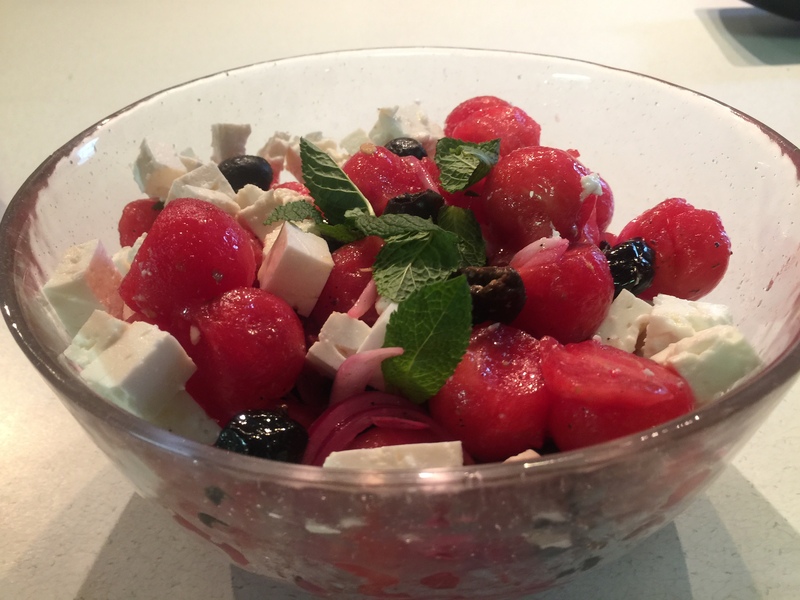 Assemble the watermelon, herbs, and olives in a salad bowl. 5. Add the olive oil and black pepper to the onions and lime juice. Stir this to combine. 6. Add to the watermelon mix and gently toss. 7. Scatter the feta over the salad. Add these at the end to maintain the white colour. DID YOU KNOW? Watermelons are mostly water — about 92 percent — but this refreshing fruit is soaked with nutrients. Each juicy bite has significant levels of vitamins A, B6 and C, lots of lycopene, antioxidants and amino acids. Watermelon is also a good source of pantothenic acid, copper, biotin, potassium and magnesium. Cancer: As an excellent source of the strong antioxidant vitamin C as well as other antioxidants, watermelon can help combat the formation of free radicals known to cause cancer. Lycopene intake has been linked with a decreased risk of prostate cancer prevention in several studies. VARIATIONS: Garnish with balls of honeydew melon for an even brighter colour! Peppery arugula greens contrast well with the sweet watermelon. A good addition to this salad. Tastes even better..you’ll see..I mean taste!! I love these photos, thank you for the recipe. 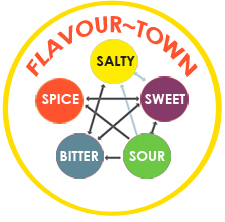 Beautiful feature photo and I like FLAVOUR TOWN graphic too. I learned about ‘Flavour Town’ from a chef in Vancouver, B.C. (Canada) many years ago. His advice for great tasting food is to mix sweet with sour (or salty). I always remembered what he said because he was so right! It is the yin/yang of great ‘tasty’ dishes. WOW! The salad looks amazing. Must try. Sweet Sour Salty – that is the very essence of asian cuisine, especially Thai, Vietnamese, Korean. Looks such a delicious salad- rainbow of colours is always so inviting. Thank you for the nomination. I hope to see your blog back up soon! You must be having some temporary concerns. I just served watermelon for dessert last night and was telling our friends about how beneficial it is. I’ve never thought to add olives to my watermelon salads but I bet the briny flavor goes well. The flavour combination is surprisingly complementary. I do not particularly care for olives but I love them in this salad! Thank you. I hope that you try the recipe. It is so delicious, healthy and so refreshing in the summer. Crispy salad and a photograph loved it!! Thank you.The salty olives, tangy cheese and sweet watermelon really brings out the flavours of each so exquisitely!